I’m posting this on my birthday which has always fallen on, or around US presidential election days. Because this year’s polling day is just a mere 3 days after my birthday, I’ve decided that it would be fun for ME to give a unique and commemorative gift (of the election, not my birthday! LOL) to one lucky reader. No matter who you’ll be voting for, I think these glasses will make great conversation pieces in your home and be treasured keepsakes for years to come. This year’s presidential race is the closest in history and it’s anybody’s guess who the winner will be! Because of this fact this year’s election is a real nail biter and makes this historical race more exciting than ever! Contrary to what others may do and say on social media and beyond, I’m not here to force my political views or discuss why my candidate of choice is so much better than the other candidate running. That’s not my style. My entire purpose in doing this giveaway is for FUN! PERIOD! Plus, it’s open to democrats and republicans alike! No judgement or ridicule! Personally I think there has been far too much of that during the past few months anyway, don’t you? 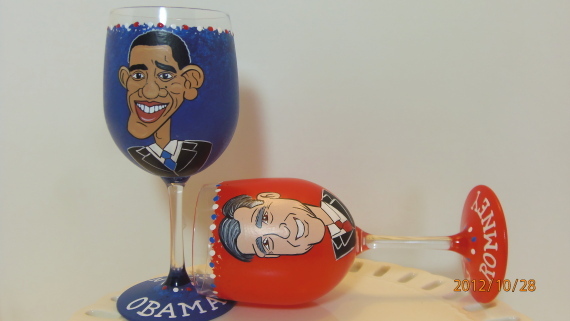 So then, if you’re interested in “throwing your hat into the ring” for the possibility of winning this pair of Obama/Romney 2012 wine glasses, all you need to do is leave me a comment telling me YOUR NAME and WHAT STATE you live in. That’s it. As easy as American pie! The winner will be chosen early in the morning the day after the election, November 7, 2012 and will be chosen via a random number generator. The winner will be notified via email. Feel free to enter as many times as you like but separate entries are required. For additional information, check out my facebook page! These glasses are completely dishwasher safe and will come in their own gift boxes. I trust you’ll all get out to VOTE this Tuesday, November 6th! I know I will and I’m excited and privileged to do so. Good Luck and God Bless America!!! Happy Birthday! And I share your "polling" celebration paradox. This year election day is ON my birthday–happens about every 3 elections. This is my half-century celebration. And the glasses–like all your works–are excellently done. Thanks for the lovely compliment on my work. I'm also wondering if you're entering to win the glasses as you didn't leave your state? Let me know so you don't miss out (if you're interested). Happy, happy birthday!!! Totally agree with you about keeping the blog separate from politics! 🙂 These glasses are awesome! Oh, I live in Texas! Thanks for the BD wishes Bridget. Thanks for entering the giveaway. Good luck! I LOVE this, Renee. And HAPPY BIRTHDAY!!! Why didn't they change election day to coincide with your birthday? I keep politics off of my blog although you know I spout my politics on Facebook HA HA! And I am a Florida voter – all 3 Americans in my household are. And I am proud to say we already voted! And whoever wins (although MY candidate had better) one will surely be drinking glasses of wine – either to celebrate or to drown one's misery! Happy Happy Birthday, darling and enjoy! Thank you Jamie! You're a sweetheart! I think I'd rather live in France with you! Happy, happy birthday!! I think they're great glasses – definitely a conversation piece (for the right family members haha!). I live in Virginia (a lovely swing state that can't wait for the election to be over)!! As a matter of fact, I'm off to see Clinton speak tonight in Roanoke! Thanks for entering Liz. Good luck! Happy Birthday!!!! I'm in southside Virginia and like so many, I can't wait for this election to be over!! I look forward to when I can turn the TV on, open my mailbox and answer the phone and it has nothing to do with politics!!! I love your artwork!! For the past 5yrs, we paint wine glasses for special family events. I couldn't imagine doing all that you do!! Hi Shannon. Thanks so much and good luck! Happy Birthday Would love to win and Yes we will be voting for sure! Thanks for the BD wishes and thanks for entering the giveaway. What state do you live in Diane? OK great. Thanks Bev and good luck!!! Hey BevB guess what? You've WON!!! Congratulations. Please get in touch with me via email and let me know your mailing address for shipment. Again, Congratulations and I'll look forward to hearing from you! I just found your email in my junk mail folder- isn't that AWFUL???? I replied with my address. Can't wait to toast the end of the election hubbub with these GREAT glasses! Hi Bev! Somehow your comment was deleted from my blog. I'm so sorry. Would you mind leaving one again so you can be entered in the giveaway? I'd hate for you to miss your chance to win. Happy Birthday, Renee! Let me say that these glasses are great stemware collectors pieces. My name is Santresa and I live in Georgia. Hi Santresa! I think I recognize you from facebook 🙂 Thanks for the BD wishes and for entering the giveaway. Good luck!!! Happy birthday from NJ! Your artwork is amazing. Thanks Jessica and good luck!!! Thanks for entering Michelle. Good luck!!! Love all your items! Happy Belated Birthday from Alabama! !